Marmalade is a fresh new bistro at The Rep Theatre, in the city centre. But don't think it's just a place to be visited before or after enjoying a show. The first time I went to Marmalade was for a quickie visit with a friend for a nice cup of latte. From the seats we chose that day, I could see the staff in the bar keeping the cocktails flowing. It pretty much made my mind to go back there and treat my husband. Marmalade is part of the Bitters 'N' Twisted venues, a selective group of successful independent bars like Bodega, The New Inn (Harborne), The Jeckyll and Hyde, The Rose Villa Tavern, Island Bar and The Village. The restaurant is a nice new addition to the Broad street area because it's well located, serving tourists, office workers, students and of course, the visitors of The Rep and New Library of Birmingham. 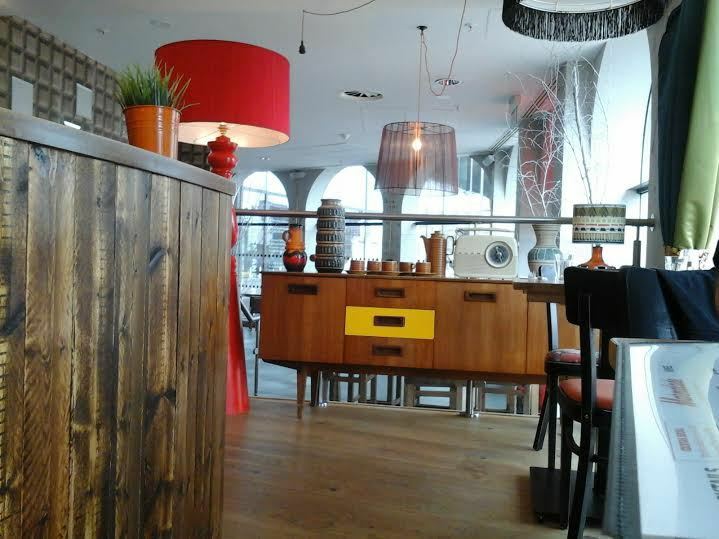 Recently refurbished, Marmalade has the retro chic décor that is really attractive to any kind of public. It's a spacious place, so the furniture displayed has the important role of keeping a nice harmony of the space. And it does! But it's not just that. Really nice service is another great feature of Marmalade. A quick chat about cucumber water led to a really nice afternoon in this restaurant. 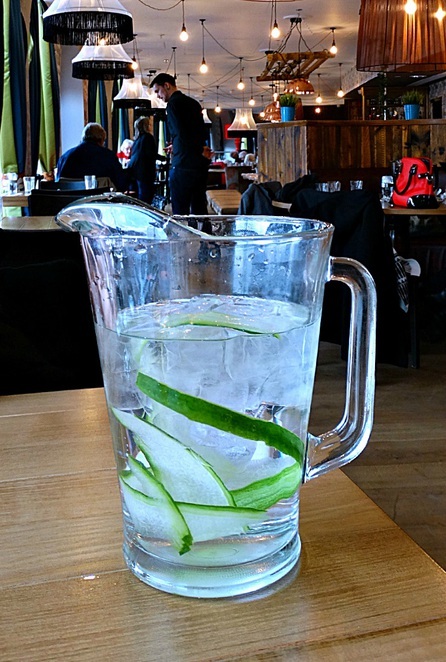 But the importance of having some cucumber water is something that would only be understood if you watch Better Call Saul anyway. So to the food it is! I was very curious about the menu, but sometimes it`s impossible to resist the "special of the day" deal, so we went for the special lunch one which included a drink, a rustic sandwich and a side for only £6. It's the perfect meal for an after work meeting or a brunch, and it was a real bargain because the quality of food at Marmalade is outstanding. Having a bagel with smoked salmon and cream cheese appealed to me, and it was rather good indeed. My other half had a Bunn's Sausage & Brie Ciabatta, which was also mouth-watering. Pudding temptations lead me to the Repertory Mess- a delicious pudding with almond, meringue, coffee sponge, whipped cream, raspberries and blueberries. Absolutely gorgeous! To make the most of it, don't forget Marmalade has also a pre-theatre menu that self explains the purpose. If going to The Rep, pop into this gorgeous bistro first. 4-	Blackberry julep - Buffalo Trace bourbon, mint and sugar built and churned with blackberries and served short. The food looks very tempting! Mmmm, especially the dessert!. You just get better all the time. The pics are really good.